Jammu, November 02 - The Deputy Chief Minister inaugurated the week-long Jhiri Mela held every year in memory of revolutionary farmer-Baba Jitto- at Shama Chak about 18 Kms from here. 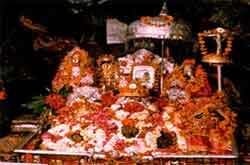 Nearly five to six lakh devotees from Jammu and Kashmir, Punjab, Himachal Pradesh, Haryana and other parts of northern India visit Jhiri to pay tributes at the Amar Samadhi of Baba Jitto and his daughter, Bua Kaudi. ` Paying rich tributes to Baba Jitoo , Deputy Chief Minister said that Jammu and Kashmir is land of saints and seers whose teachings are rooted in its long cherished traditions and culture. Highlighting the high ethos of struggle and determination observed by Baba Jitto, he said that his teachings are a beacon light for leading a righteous life. Deputy Chief Minister stressed upon the Mela Organising Committee to come up in a big way to educate the masses about the high traditions and composite culture of the State. Agriculture, horticulture and other departments are holding exhibitions and stalls in the Mela, Minister called upon the farmer community to come forward and take the advantage of latest technology being introduced in various types of farming through these exhibition stalls. Deputy Commissioner Jammu Mr M K Dwivedi , Director Agriculture and other senior civil and police officers were alos present on the occasion. The Minister also distributed prices among the winners of wrestling competitions, which forms a major part of the yearly Mela celebrations.